Radio Disney is sending one lucky fan to Nashville, TN to attend the 52nd CMA Awards live in Music City with the Radio Disney CMA Awards Live in Music City Sweepstakes. For your chance to win, visit radio.disney.com and enter by November 1, 2018. 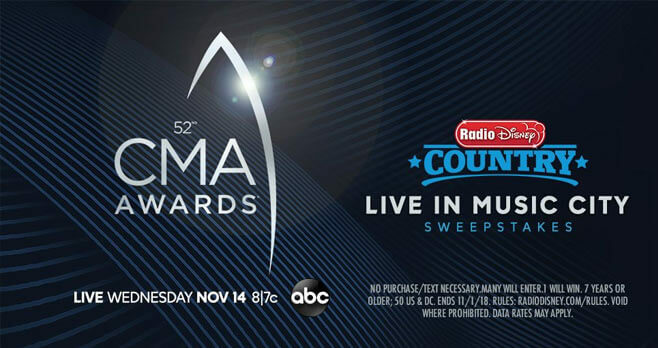 The Radio Disney CMA Awards Live in Music City Sweepstakes is open to anyone 7 years of age or older who is a legal resident of, and physically resides within the 50 United States or the District of Columbia. The Sweepstakes begins at 3:00 am PT on October 13, 2018 and ends at 3:00 pm (PT) on November 1, 2018. Limit 1 entry per person per day. The grand prize consists of a 3 day / 2 night trip for up to 4 people to attend The CMA Awards in Nashville, TN, and meet a Radio Disney Country Artist. Visit radio.disney.com to enter and see Official Rules for details.